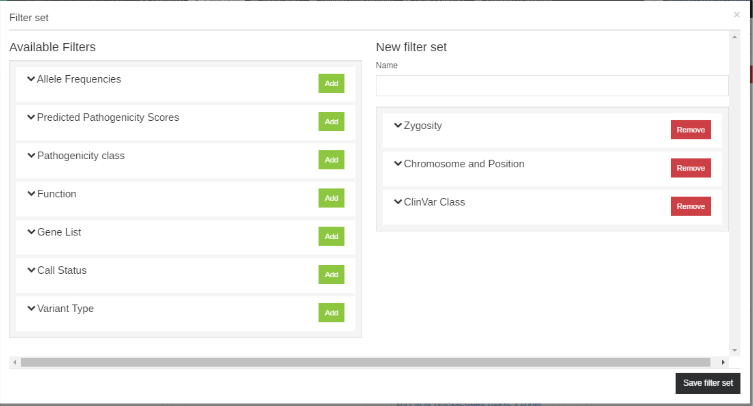 Click on Filter sets to create and manage filter sets, which you can use on multiple samples. You can duplicate sets, reorder filters within sets or drag and drop filters from set to set. Click on create new set to create a new filter set. A pop-up window called Filter set will appear. This window is split into two columns: Available Filter Sets and New Filter set. 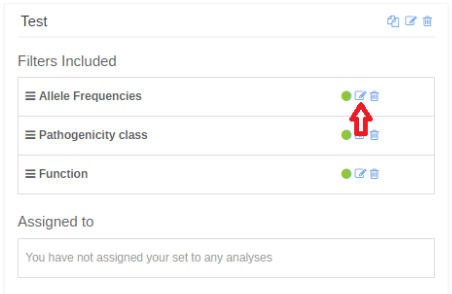 The available filter sets can be selected by clicking on the green box ("Add") next to each filter’s name. If you select a filter, the filter will move to the other column. By clicking on the "filter name" or on the arrow, a form is displayed where the filter can be edited. Once you have finished editing your new filter set, give it a Name and click on Save filter set.